Polishology: Are You Feeling Flirty? Or Shy? Are You Feeling Flirty? Or Shy? 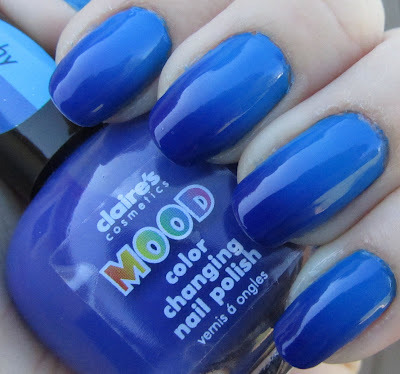 While searching through my polish drawers for a fun untried polish, I remembered that I had yet to wear three out of the four Claire's Mood Polishes that I bought last fall. Especially since I had some nice long nails for a gradient/tip effect, I decided to play with these babies some more! Claire's Flirty/Shy Mood Polish is a really great blue color changer - dark indigo when cold and a warm blue when hot. The coolest thing about these polishes, for me at least, is that my normal body temp seems to be perfect to create a gradient look. However, when I am freezing to death in my lab all day they tended to stay quite dark, haha. While this polish is totally gorgeous and the effect is awesome, application and wear are a bit tricky. This took five coats to get totally opaque and smooth - yikes! The first few coats were very streaky and nasty, and four (thicker) or five (thinner) coats are necessary to have no VNL. Wear is also a challenge - after two days I started getting some rather large chips. But the effect is cool enough to make it worth it, I think. 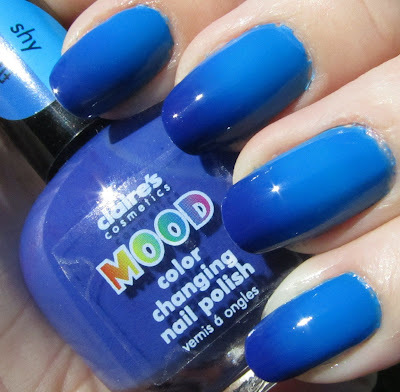 Do you all have any of these fun mood polishes? If so, how do they hold up for you, and do you have any tips on keeping them nice longer? I'd love any advice! The Polish that Started it All!